When you’re ready, download over 40,000 data points to your PC for further analysis. Data logging has never been this visual. 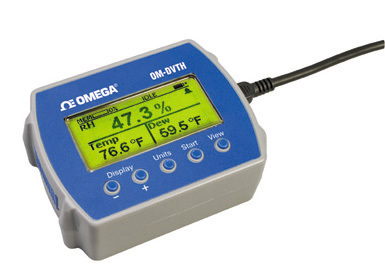 The OM-DVTH is capable of sampling as fast as once per second or as slow as every 18 hours. A total of 43,344 temperature measurements can be stored in the data logger memory if only temperature is measured, or 21,672 measurements for temperature, humidity and dew point if all three parameters are measured. Easy-to-use Windows software is included with the OM-DVTH. The software is a full-featured program that allows you to set up all data logger functions including sampling rate, logging duration, start mode, logging mode, and high and low temperature and relative humidity alarm values. Once data has been logged, the program then allows you to download data from the logger, plot the data and export the data to an ASCII text or Excel file format for further analysis. 참고: Comes with complete operator’s manual and Windows software on CD ROM and 1.8 m (6') USB interface cable and batteries.